With Instagram being such a go-to place for bloggers, keeping your account up to scratch isn’t that easy. Sometimes, it’s necessary to mix it up a bit and make things much more interesting. Fortunately, there are loads of landmarks in Britain that can help you do this. We’ve got together with Cottages in Northumberland, who offer cottages in Beadnell, to discover the places you may not have seen on your journeys around the UK. If you want to add some landscape shots to your profile, Northumberland should be your first stop. You can enjoy a walk to Ketley Crag Rock, which is the home to mysterious cup and ring carvings that have recently been named as Ancient Monuments by the Department for Culture, Media and Sport. Researchers have confirmed that these markings were made between 3800 BC and 1500 BC, but are still unsure of their meaning. At times the fast-paced surroundings of London can be a bit overwhelming and this landmark can be really easy to miss among the thronging crowds of people – but next time you’re in Trafalgar Square, head over to the south-east corner to find this hidden treasure. It’s been there since 1926 and was built from a hollowed-out lamppost to help policemen keep an eye on protests — which were and still are very commonplace in Trafalgar Square. The tiny police station could hold up to two prisoners at a time and had a direct line to Scotland Yard. These days it’s used as a broom cupboard for Westminster Council, but Britain’s smallest police station is still the ideal size and location for a selfie. If you love treehouses and want to see a pretty extraordinary one high up in the branches, head to Alnwick and you won’t be disappointed. The Treehouse in Alnwick Garden is one of the largest wooden treehouses in the world. It’s made from Canadian cedar, Scandinavian redwood and UK pine. Be sure to head into the café by walking across the rope bridges. Eateries make for good places make for Insta-pics, especially if you’re a foodie and love to showcase unique dishes to your followers. If what you are searching for is a unique feature of a very old building, this is the place for you! The Pineapple, in a little village in Falkirk, Scotland, was built in 1761 by the Earl of Dunmore. It’s an eccentric summerhouse surrounded by a walled garden. You’re probably asking yourself why it’s named after a pineapple. Well, during the 1700s, the Earl of Dunmore was serving as governor in the state of Virginia, where sailors would leave pineapples on gateposts to announce their safe return from sea. On returning home to Scotland, Earl Dunmore decided to bring this tropical custom to Scotland in a more permanent way. 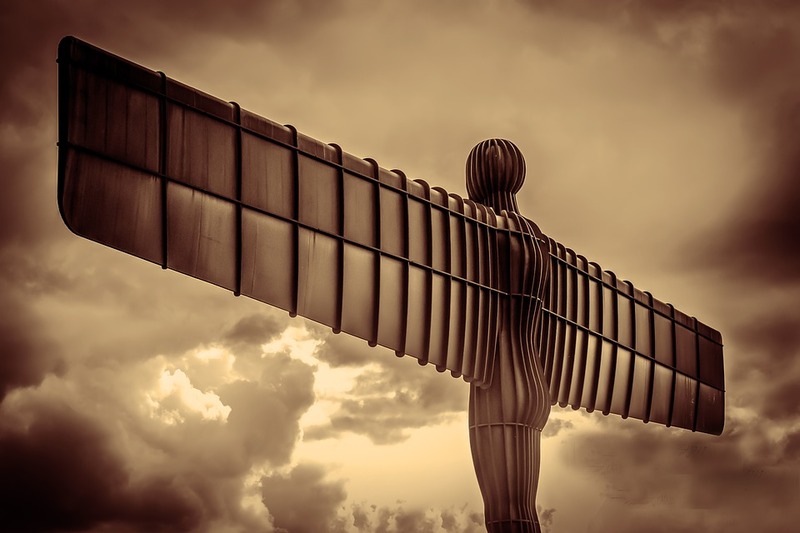 The Angel of the North is higher than four double-decker buses placed on top of each other and has huge wings the size of a jumbo jet – it’s the most dominant landmark in the north. If you haven’t already seen it, you definitely should! The Angel of the North attracts over 150,000 visitors each year and is considered to be the biggest angel sculpture in the world. This spot, in Conwy, has now appeared in the Guinness Book of Records and has been confirmed as the smallest house in Wales! Incredibly, 19th-century couples lived in the house and it was last occupied in 1900. If you’re looking for a picture that will trend, then this is the one for you and it will be sure to bring in plenty of likes! If you are looking for your Instagram to connect with creative and curious minds, this is one location that you must visit if you’re in or near London. Amazingly, it actually has a shark on its roof! You’d naturally assume that it is part of an eccentric bar or restaurant, but the man-made shark is actually part of the roof of someone’s home in Oxford. However, it’s definitely worth an Insta-upload! It’s made from painted fibreglass and has become one of the town’s most famous residents since it was installed in 1986. Despite legal battles to get the shark removed on health and safety grounds, it’s still there and people from all over the UK take the opportunity to snap a selfie with him (or her! ).